Leonardo devoted great effort to understanding balances and pulleys, and how they could be understood mathematically. He was also concerned with balance in the human body. 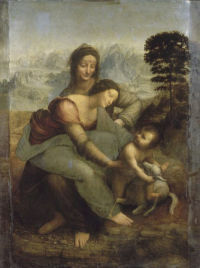 In this painting, Leonardo’s understanding of weight and balance allowed him to give perfect visual expression to a divine, abstract ideal. The Virgin is perfectly balanced on her mother’s lap whilst reaching forward to embrace her child. Christ seems more intent on playing with the lamb (a sacrificial animal and symbol of his death by crucifixion). While the Virgin’s forward momentum implies that she is about to slide off her mother’s lap, perhaps to part her child from the lamb, she is actually pivoted at the point of perfect equilibrium between stasis and movement. The sense of balance and weight achieved in the figures of St. Anne and the Virgin is the perfect expression of the eternal harmony and stability of Christian love. Weight desires to act in a single line, that is, towards the centre of the world, and force an infinitude. Weight is of equal power throughout its life and force always weakens. Weight passes by nature into all its supports and exists throughout the length of these supports and completely through all their parts.